Unidentified Thief Caught On Camera Stealing $45,000 Banksy Print From Exhibit Toronto police say Trolley Hunters was stolen from the unauthorized show Sunday — and they've released surveillance video backing it up. That hasn't quieted conspiracy theorists, though. The Toronto Police Service released this image of the Banksy print Trolley Hunters, apparently stolen from an exhibit Sunday. Then, in the surveillance video released Thursday by Toronto police, the person ducks into the camera's blind spot and emerges with artwork in hand. The thief then quickly carries it out the door. 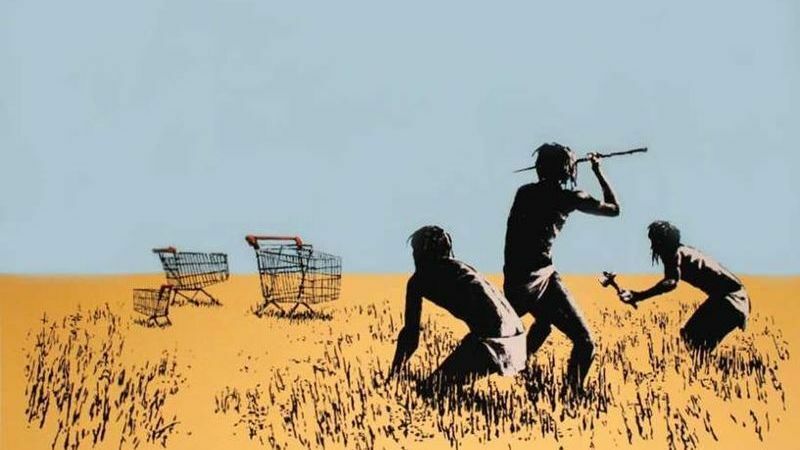 The apparently burgled work is a print of a piece known as Trolley Hunters, which had been featured in The Art of Banksy, an unauthorized exhibit of the street artist's work. Now, law enforcement is seeking assistance in finding a man "described as wearing glasses, black jacket, green camouflage baseball hat, blue jeans rolled at the cuff, grey running shoes, glasses." They say the stolen work is worth about $45,000. It bears mentioning that this isn't the first time the Toronto exhibit — billed as "the largest Banksy exhibit ever assembled!" — has drawn widespread attention of the less-than-positive variety. The show features privately owned art curated by Banksy's former agent and collectively valued at over $35 million, according to organizers. It displays more than 80 works. The originals tend to be graffiti on building facades, seen for free by passers-by, rather than pictures hung from studio walls. Meanwhile, a general-admission ticket to attend the exhibit costs about $25. And that discrepancy was not lost on some skeptics, many of whom have pointed out that one of the artist's prevailing themes — seen most vividly in the 2010 Banksy film Exit Through the Gift Shop — has been the lambasting of the art world's commercialization and cults of celebrity. Just this week, in fact, Banksy spoke on this point, talking about submitting work to a Royal Academy exhibition under an anagrammed pseudonym and getting refused. "Then a month later I got a mail from the co-ordinator Grayson Perry asking me to submit something so I sent it again," Banksy said on Instagram. "It's now hanging in gallery 3." Partly for that reason, perhaps, and partly out of a paranoia that seems suitable when speaking of Banksy, several commenters on the police video and elsewhere on social media appear to have agreed on a single culprit for the theft: Banksy himself. According to the Canadian Broadcasting Corp., though, the show's publicist has "denied any suggestion the surveillance video was fake or a publicity stunt. She said the thief may have taken only one Banksy piece out of fear of discovery." And Toronto police are taking the matter very seriously and are looking for suspects.